It has been said; “Good friends are like stars.... You don't always see them, but you know they are always there” Wow, what truer words could be spoken about one of my favorite wineries in Sonoma. 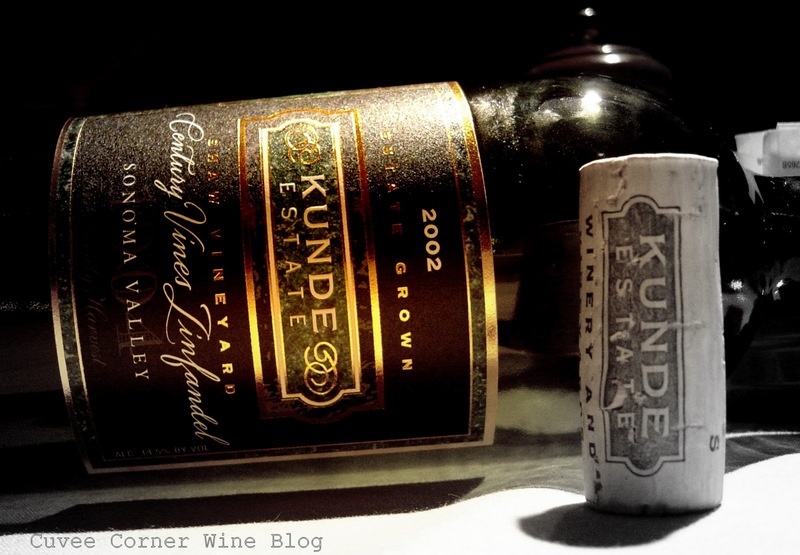 The first time I discovered Kunde was well before I did any kind of wine writing. In fact, it was my first time in Sonoma and Mrs. Cuvee and I were just a newly “minted” couple. We were still wet behind the ears with matrimonial bliss, [ha] ahh the memories. I remember it was a slow day in the tasting room and we had paid for the reserve tasting, took the "wine-caves" tours, glasses in hand, this where we encountered the same Century Vines Zinfandel from the 2002 vintage. We were so happy with the quality of the wine, we knew we had to take a few home [ I wanted to take more than a few home, but the wife scuttled that idea]. We also brought one of the CV Zins to dinner at the highly recommended Applewood Inn & Restaurant in Guerneville. I photographed the bottle at the table, thinking I really want to remember this bottle, how it tasted, how it made us feel and the excitement of finding a bottle of wine that helped us to celebrate our anniversary. Fast forward some years later to the future, Mrs. Cuvee and I are still drinking wine and really enjoying it more than ever. Now instead of just taking a few pictures of the wines I fall in love with or jotting down some notes about what I liked about a fab new favorite wine. I share my thoughts with the readers of my blog, which is great fun for me. I think it has been a few weeks now, since I participated in the Kunde "live-tasting" on twitter and had a great conversation via the live video feed with the winemaker Zach Long and estate owner Jeff Kunde and Marcia Kunde Mickelson. It really was like catching up with an old friends. I also had the chance to catch up with some new wines of which I was not familiar with, but was happy for the opportunity to receive a sample of their 2009 Kunde Family Estate Sonoma Chardonnay, the Kunde Family Estate Red Dirt Red and got reacquainted with an old friend the 2008 Kunde Family Estate Reserve Century Vines Zinfandel. Although Kunde Family Estate has just put their 107th harvest behind, slumbering in barrel, they have not missed a beat in producing well made wines, that often tip the quality to price ratio scales. If you find yourself in the heart of the Sonoma Valley, tooling down the Sonoma vino super-highway, be sure to stop by the tasting room, behind the massive door to get inside are few different ways to enjoy their wines and may I also recommend the "free" daily wine caves tours, quite a treat for wine-newbies to see the wines slumbering away, developing character, finesse and complexity. One of today's buzz words is "sustainability" and the Kunde Family estate is proud to say that they have been "certifiable" since 2005, in fact they have been awarded a Green Business Program Certification from the Bay Area Green Business Program. Now it is time to review the wine that were sent for the review process, after all reviewing wines is the heart-beat of this site and one of the main reasons you tune-in here on occasion. Now that said, I mentioned above I received three samples for this twitter taste live event, two of them knocked it out of the park. The other stalled in the red-zone and had to settle for a field goal attempt. 2009 Kunde Family Estate Chardonnay: This wine sells for a SRP of $17. This wine can be found under a screw-cap for easy access. A wine accented with ripe and spicy pear, a slap of hazelnut laid over a vivid structure and right touch of acidity to carry the fruit, nice mid-palate, but fades a bit toward the end. My score 87 points, paired nicely with seasoned grilled chicken breast. 2008 Kunde Red Dirt Red: This wine sells for an SRP of $28, under a cork closure.. It really lit up the score board nicely; with their reliable blend of Barbera, Syrah, and Zinfandel finished with a drop of Sangiovese as the exclamation point. This wine is made in a drink now and drink often style, uncorked it's dressed to impress. This is the type of blend, that will lend it self to many pairing opportunities, but I'd stick with a trio of some of my barbecue faves; Chicken, Pork, or slow-smoked beef ribs. Abundant dark plum and ripe cherry flavors, painted on a canvas of intensity, balance and voluptuous structure. My score is 91 points. This wine is highly recommended. 2008 Reserve Century Vines Zinfandel: This wine has a SRP of $30, under a cork closure. As I often say during these live tastings, like they guy with no filter, tasting the wines out of order at times, "this is the big boy in the room". To say this wine is a monster of finesse, would be a huge understatement. Depth and complexity draped over abundant red and dark fruit, make this Zinfandel the mother of all "old-vine" Zinfandel's. The Zen of Zinfandel's should really be the title of this wine. In a game of poker with other supposed old vine zins, this wine would be "all-in" sitting pretty with a full house and no I'm not bluffing. Folks this Zinfandel is the real-deal, not a pretender to the throne like so many other so-called Old-Vines Zins. This wine is produced from the Shaw vineyard [don't miss this] which is reported to be 126 years old, Booyah! This is my second encounter with this same vineyard and oh my the layers of flavor, piped with nice acidity, give the fruit real pop. This is how you do it, not a jammy note insight, this wine is a seamless and the flavor sails on into the horizon. Well done, I give this wine 94 points. I hope you will seek this wines out and give them a swirl for yourself soon. All the wines recommended above, were sent as a sample for the review process. The recommendations and scores are based solely upon my opinions and impressions, no other type of compensation is given or offered. I receive many wines for the review process and unfortunately not all of them make the cut. That said, thanks for stopping by today, I hope you continue to sip long and prosper, cheers!